Project Description: This lesson can be done as a stand-alone art lesson or in conjunction with a nature science lesson. For this lesson we used leaves as an inspiration. Students choose leaves they want to trace. If possible go for a walk and collect leaves as a class for this lesson. If not, supply a variety of sizes and shapes for the class to use. 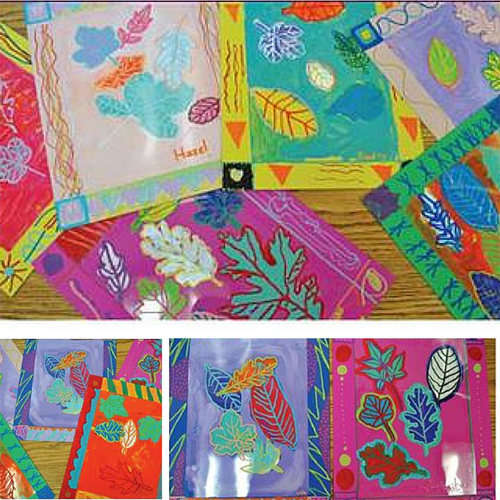 Students place leaves under the Clear-Lay then trace the edge and veins with a paint pen. Repeat with different leaves and different colors until student is happy with design. Let the paint dry (this just takes a few minutes), flip Clear-Lay over so that paint pen leaves are face down. Apply acrylic paints to the back¬side of Clear-Lay. It just takes about a dime size of color to paint each leaf and about a quarter size to paint the background. Encourage them to try mixing colors on brush, i.e. a dab or orange and a dab or red to make the painting more dynamic. Let dry before flipping over to see results. To prepare mounting, use colored tag board an inch and a half larger around than the Clear-Lay sheet. Using paint pens create a border for their leaf art. Using double stick mounting tape, mount dried painting with leaf side up to plain or decorated backing board.